Pound cake, a pound of this and a pound of that, has been a dessert mainstay since Colonial times. A rich and satisfying cake, it is an excellent choice for dessert or afternoon tea. This version, by our cousin, Patty, has blueberries added for additional flavor and color. 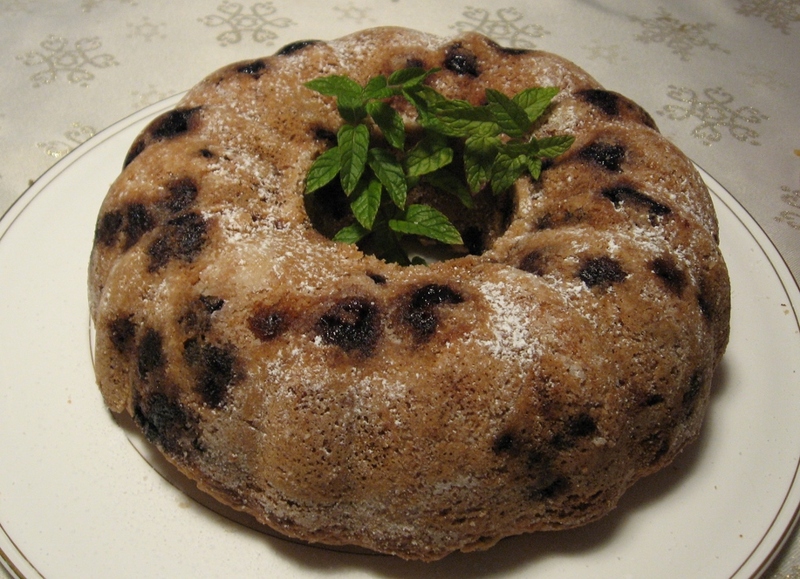 Add the still frozen blueberries at the very last to minimize the blueberries bleeding into the surrounding cake. Butter and flour a large Bundt pan and set aside. Use a mixer to cream butter and sugar, continue on high until fluffy, about 6 to 8 minutes. Scrape sides of mixer bowl and add vanilla. Mix at medium speed until combined. In a second bowl, lightly beat eggs. Add to mixer in four or five batches, mixing at low speed, scraping down side of bowl between additions. Reduce speed to low and carefully and slowly add flour mixture in four or five batches, mix batches until just incorporated. Add frozen blueberries. Fold in berries, just enough to mix. Ladle batter into prepared Bundt pan. Tap pan on counter to settle. Level with a spatula, if needed. Bake in a pre-heated 325 oven until a toothpick comes out clean, about 60 to 70 minutes. Cool on wire rack for half an hour before un-panning. Allow to completely cool on rack, about 1 hour.